The Comfort Zone Illusion by Susan Neustrom, Ed.D. What is this place called the comfort zone? Where does the comfort zone exist? Why is stepping outside of the comfort zone so frightening? 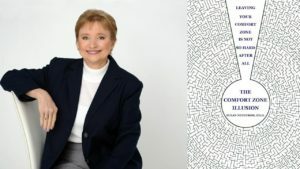 The Comfort Zone Illusion answers those questions by taking you on a journey of discovery to uncover the mystery of the very personal space we call our comfort zone. It is an exploration through the stages of change, beginning with the very first step outside of the comfort zone to exposing the five walls of fear that create barriers to change. This book looks beyond the illusion of comfort to the stark reality of the discomfort of change, and offers strategies to transform fear to energy, break down the brick walls of fear, develop movement habits, and create success enablers. Every breakthrough exercise provides a reflective understanding of your comfort zone, and although the exercises have a specific purpose, each offers a chance to reveal an “a-ha” moment. One of those moments is the turning point, the awakening to move you out of being stuck in the comfort of where you are to where you are meant to be. To order The Comfort Zone Illusion click here.